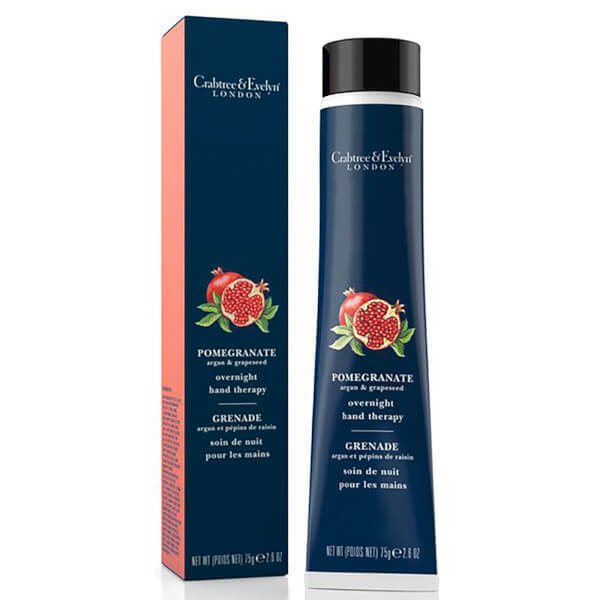 Treat dry, hard-working hands to the Crabtree & Evelyn Pomegranate, Argan and Grapeseed Overnight Hand Therapy; a deeply nourishing formula dedicated to replenishing and regenerating skin. Infused with a concentrated complex of vitamins and amino acids, the lightweight, intensive treatment absorbs quickly to soften and hydrate, whilst combating rough, uneven skin for long-lasting comfort. Supports the skin's natural moisture barrier to leave hands feeling smooth and comfortable with a luxurious fragrance of sweet pomegranate, citrus and fresh fig leaf. No greasy or sticky residue. Presented in a matching gift box. Apply nightly and awaken to smoother, softer, nourished hands.